Moving is never easy, and Matt and Stephie soon learn that life in Moody Bay is something else again. Matt is befriended by outsider Joey Field, who is believed to have “the gift” of seeing things, and Stephie’s new best friend is the sister of the school bully! 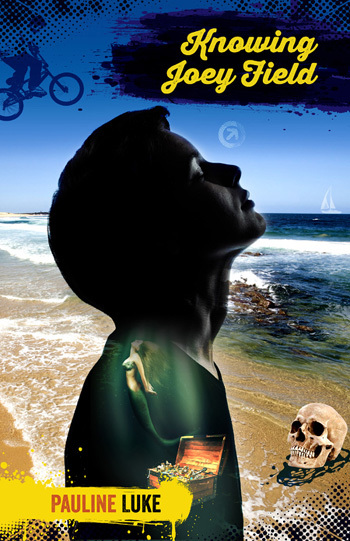 Is there any truth in the tales of sunken treasure? And who is behind the spate of increasingly violent robberies and break-ins? Told by both Matt and Stephie, Knowing Joey Field is a story of mystery and intrigue, of friendship and acceptance that is sure to appeal to the older reader. Rebecca is fourteen, and finding out that life is becoming increasingly complicated. Having to live with a gross brother called “Frog Face”, a grandfather who’s into colour meditation, and the world’s ugliest dog is no picnic. Throw in a best friend called “Amber” and a worst enemy called “The Grasshopper” and you have the ingredients for a fast paced, fun, and insightful glimpse into being a teenager. 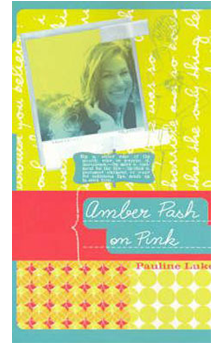 Amber Pash on Pink won the Australian Family Therapists Award for the best book for an older reader by an Australian author, 2005. When Mayor Banks announces that the historic Turra Bend Middle School needs to be demolished, Luke and his friends decide something has to be done to stop it. But what can a film nut, two netball maniacs and someone whose mother feeds him tofu and bean sprout sandwiches do to stop someone with as much clout as Bill Banks? Especially if they use the power of words. 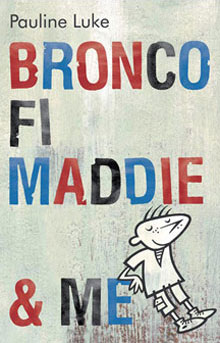 Bronco Fi Maddie & Me is listed on the Victorian Premier’s Reading List.